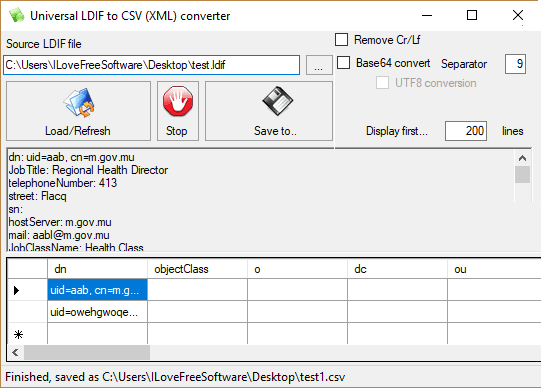 This post lists some free LDIF to CSV converter software for Windows. These software take a LDIF file from you and then help you convert it to CSV. With these simple software, you can convert any LDIF file that you have to custom delimited CSV. These tools read the LDIF file precisely and extract the fields from them and then save the final CSV file. 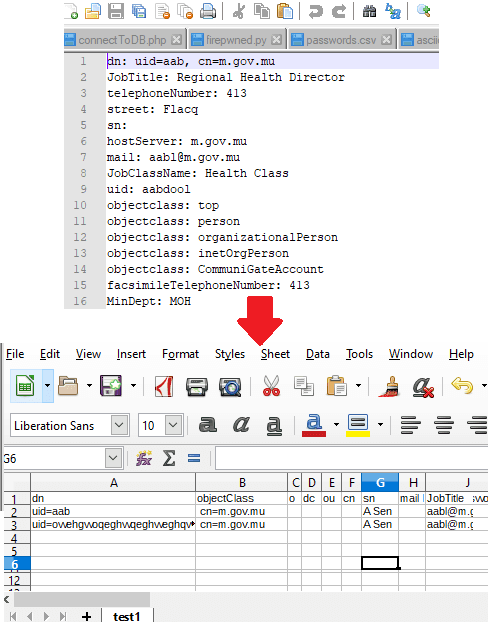 You can open the CSV file in any spreadsheet software or further convert that to other formats such as XML, JSON, etc. LDIF is a data exchange format used by Thunderbird and some other software. If you have a LDIF file that contains the address information of various people and want to convert it to other formats then this post will be helpful. You will find a command line tool as well in the post below. Using command line tool, you can convert multiple LDIF files to CSV if you want to. If you are thinking of creating your own tool to do the same then the command line tool is open source and you can learn from it. Universal LDIF to CSV Converter is simply graphical interface based software to convert LDIF files to CSV. Not only CSV, but it can even help you convert an LDIF file to XML as well. It is a portable software and you just have to load an input LDIF file in it and it will simply export the final file in CSV format. Before converting the file, you can even see then contents of the LDIF file that you open it. It maps the data from LDIF in tabular form and you can see the table preview data in the software itself. The fields are not editable but this is helpful to see how the data will look. This software has a very simple interface where you just import an LDIF file and save corresponding CSV. In addition to this, there are some additional options in it that you may consider during the LDIF to CSV conversion. It lets you remove CR\LF line endings from the input file as well. You can also opt to for Base64 convert and there is a field to specify the separator. But I will suggest you to start the conversion using default values. Download the software and run it. Use “…” button to open an LDIF file from your PC and then hit “Load/Refresh” button. It will read data from LDIF and display that in a table. You can see the data and make sure whether all the fields are mapping correctly. Finally, convert it by clicking on “Save to” button. It will ask you a destination and you have to specify CSV as the output option and it will save the corresponding CSV file. LDIF to CSV(homepage) is a command line tool to convert a given LDIF file to CSV. There is only one command you have to execute to get it done. This is a simple tool, written in Python to convert the LDIF data to CSV in blink of an eye. If you have used a command line tool before then you can simply grab it and run it for LDIF to CSV conversion. Also, it is an open source tool and its complete source code can be found on GitHub. For getting started with this, simply clone it on your computer from GitHub. After that, extract it and then open a command or terminal windows there. Now, just place the source LDIF in the same folder and then run the command in the specified syntax. 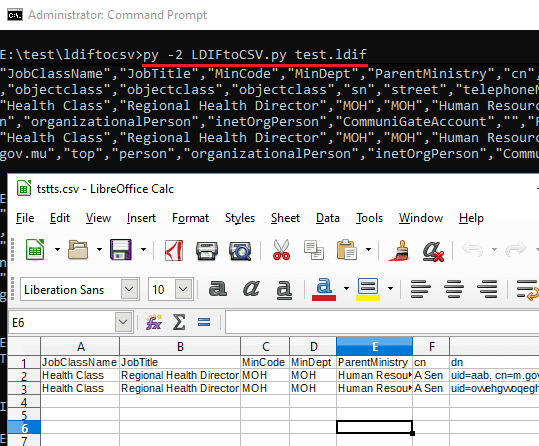 Do note that, it works with Python 2.7.
python LDIFtoCSV.py "Input LDIF File"
Above command will leave the CSV output on the command prompt. You can copy paste that in a blank file and save it as CSV. Or, you can simply add something like “>test.csv” at the end of the command to save data in CSV file directly. You can run this tool in this way, to quickly convert an LDIF file to CSV. If you want to use a custom delimiter in the CSV file, you can specify that through a command line argument. These are the only software to be use on Windows to convert LDIF to CSV. Both the tools mentioned above can easily convert any given LDIF file to CSV in a few seconds. The command line tool that I have mentioned above can help you with the bulk LDIF to CSV conversion if you have some knowledge of batch files. So, if you are looking for some free tools for LDIF to CSV conversion, then you can use any tool in the article above.